The second day of the Seamaster 2017 ITTF World Tour Platinum German Open very much belonged to Team Germany as the home fans celebrated terrific performances from their players involved in Men's Singles quarter-finals action, while a couple of big shocks also occurred on Saturday 11th November so here is our quick summary of day two of the event being held in Magdeburg. Impressive at the recent Liebherr 2017 ITTF-Men’s World Cup, now Dimitrij Ovtcharov and Timo Boll are potentially two victories away from lifting the Men’s Singles trophy in Magdeburg following positive displays from the host nation representatives in their quarter-finals encounters. Seeded third and fourth respectively, Dimitrij Ovtcharov and Timo Boll negotiated difficult fixtures against Hong Kong’s Wong Chun Ting (11-1, 5-11, 11-5, 7-11, 11-4, 11-3) and China’s Lin Gaoyuan (11-7, 11-9, 11-13, 11-7, 14-12) to earn their places in the last four. Fan Zhendong is also through to the semi-finals after the top seed successfully saw off Kenta Matsudaira across five games (11-8, 11-6, 11-5, 8-11, 11-9). However, it is surely Lee Sangsu who came away with the result of the day following his superb straight games triumph over China’s pen-hold specialist Xu Xin (11-6, 11-9, 11-4, 12-10). There were mixed emotions for Japan over in the Women’s Singles draw as Mima Ito and Kasumi Ishikawa attempted to send the country beyond the quarter-finals stage of the tournament. Mima Ito experienced somewhat of a shock defeat, losing out to Chinese qualifier Feng Yalan (11-6, 11-13, 4-11, 7-11, 9-11) in the lower half of the draw. Yet, there was joy for the other Japanese contestant in action as Kasumi Ishikawa, third seed, claimed a fantastic four games to nil victory over the defending champion Wu Yang (11-4, 11-7, 11-8, 11-3) to keep her title bid on track. 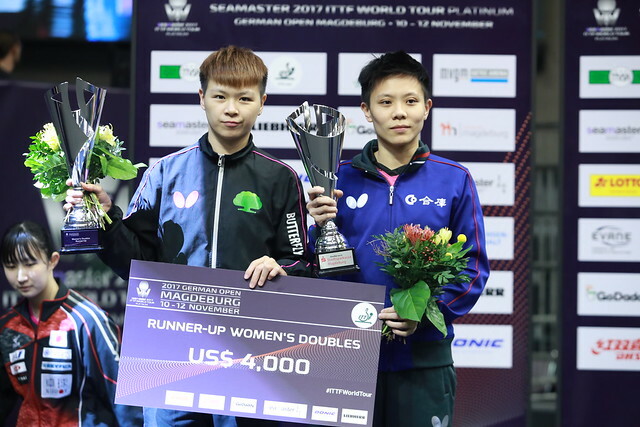 The full five games distance was required in both of the Women’s Doubles semi-finals fixtures as partnerships from Chinese Taipei and Japan emerged victorious. Chen Szu-Yu and Cheng I-Ching recovered from a two games to one deficit to oust Hong Kong’s Doo Hoi Kem and Lee Ho Ching from the event (11-3, 6-11, 9-11, 11-8, 11-8) while the mixed nationality team of China’s Gu Yuting and Hong Kong’s Soo Wai Yam Minnie lost out to the Japanese teenage duo of Hina Hayata and Miu Hirano (11-7, 3-11, 10-12, 11-6, 11-7). Japan will also be represented in the Men’s Doubles final following a dominant showing from Yuto Kizukuri and Tomokazu Harimoto in their encounter against Ho Kwan Kit and Wong Chun Ting (15-13, 11-2, 11-4) and will face opposition from Lee Sangsu and Jeoung Youngsik in the title match with the Korean pairing seeing off Lam Siu Hang and Yu Ziyang (11-5, 11-8, 1-11, 11-3) in the other tie.